If you’re new to yoga, you might be wondering why you need a Yoga blanket. No it’s not for curling up to take a quick nap when you’re tired! Any avid yoga lover will tell you the importance of buying the best yoga blankets is to ensure you’re comfortable during your session. Whether you use it to provide support for your hips or cushion those buttocks, it’s definitely worth adding to your yoga props list. 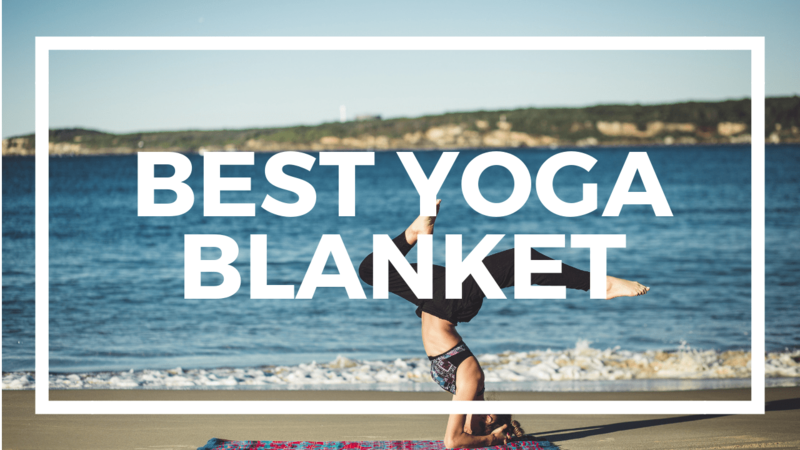 We took the liberty of reviewing the best yoga blankets available on the market. 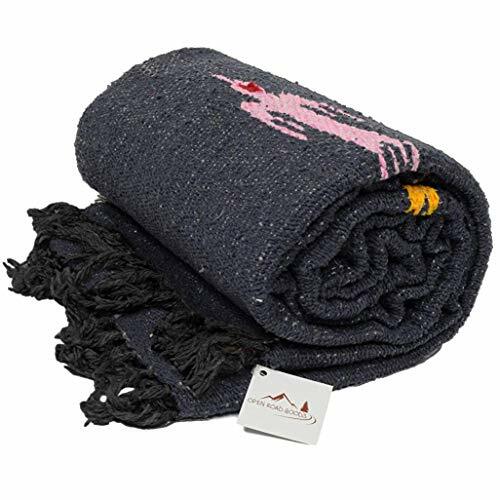 Open Road Goods Charcoal (Dark Grey/Black) Thunderbird Heavyweight Yoga Blanket or Throw - Made for Yoga! Yoga blankets, also known as Mexican blankets, come in various shapes and sizes. How will you know which one to pick? It boils down to personal preference. Below are a few basic features to look for. You’re probably thinking any material will do right? The fabric of these yoga blankets will contribute to a lot of factors including the feel, weight and even cost. The material of the yoga blanket will determine the final texture and how it’ll ultimately feel against your body. You’ll agree we all want a soft blanket that feels amazing on the skin. In that case opt for cotton blankets. They’re well known for their soft luxurious feel and come in different weights. A blanket made of wool is another option. But wait – don’t think scratchy just yet! These blankets are made of recycled wool which not only makes them soft but environment friendly too. Not only are they comfortable but they’re both durable and warm. The only downside is they might be a bit heavy. Some blankets come in a mixture of these fabrics – for instance blended blankets. They’re generally a mixture of cotton, polyester and acrylic. Blended material is the most common type used in yoga blankets. Because of this mixture, the price of these blankets is significantly reduced plus the staying power of dyes is increased. However, bear in mind that the choice in fabric will depend on the surface and room temperature. If the room is too hot, a woolen or vinyl rubber blanket might not be ideal. Your choice of fabric will also depend on the intensity of your yoga routine. Intense workout sessions require a blanket made of thicker material to provide maximum stability. You don’t have to compromise on style when going for your yoga routine. These blankets come in a variety of styles so you’ll find one that matches your taste. If you’re a fan of patterns and colors, you might love the Mexican blankets. These brightly colored blankets are the most common style of yoga blankets and are made of a blend of materials. Style and quality can also go hand in hand. If you want a blanket that’s both chic and durable, opt for felted blankets. These thick blankets are made of wool and are by far the toughest blankets on the market. The fibers go through manufacturing processes repeatedly making them not only strong but super soft. However, be prepared to spend a few extra dollars because they tend to be a bit on the expensive side. If you prefer keeping it simple that’s okay. Not all of us like busy prints and patterns. In that case you might like the tight-weave yoga blankets. They come in a variety of solid colors and are characterized by a tight knit structure which also makes them durable. The length of the blanket will determine how easily you can transform it into different shapes to aid in your yoga poses. You can fold it into a pillow or mat to sit on. The larger it is the more shapes it can be made into. TIP: Always select a blanket which is at least as tall as you are. It will come in handy for those relaxation exercises or for simply covering yourself after class. 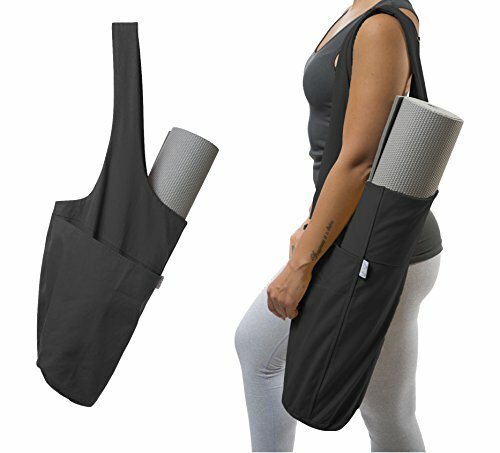 Now that you know what features to look for, how exactly can this yoga blanket help you with your poses? This blanket will help you in some not-so-comfortable postures by providing a support structure where your body isn’t flexible enough. Every mother-to-be in a prenatal class will agree that these are heaven sent because of the support and protection they provide. Whether you use them to support your back or provide a soft cushion for your baby bump, they’re definitely must haves. How do you avoid those undesirable cramps that come with practicing yoga outdoors? Get a yoga blanket. Stretching on slippery surfaces makes the body vulnerable to fatigue resulting from straining the body. Yoga blankets restrict undesired body movement offering more stability for your poses. Though they’re soft to the body, they offer a firm grip on the floor. Yes, there’s a scientific reason to using a yoga blanket. Did you know during yoga if your body isn’t isolated from the ground, the heat generated gets grounded and negatively affects your body? A woolen yoga blanket helps the body retain heat while allowing a better surface to do away with sweating. The idea of sitting and touching the ground directly while engaging in your exercises doesn’t sound appealing right? What about all the people who walk all over that space leaving all sorts of unsavory elements? Working on a personalized space is more hygienic and will protect you against any germs and bacteria. Different blankets require different cleaning instructions. Bear in mind that cotton shrinks so always hang to dry or tumble dry with no heat. Machine wash using cold water. Use cold water and never tumble dry as it may cause pilling over time. Never tumble dry because the weave may be affected. Now let’s look at the yoga blankets worth considering. Add a pop of color to your yoga session with this classic Falsa blanket. 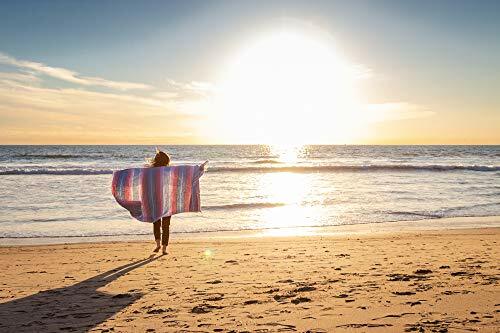 This brightly colored blanket measures 47” x 68” so it’ll cover most of your body. With over 30 different colors to choose from, you’re guaranteed to find one that appeals to you. Did you know that colors can influence your mental state? A cool combo will enhance your meditation state while a bright orange can foster an energetic mood. And best of all, washing it won’t fade the color away; if anything it’ll make it softer. These blankets are light so you’ll have a more balanced surface. This will ultimately allow you to execute those complex yoga poses with ease. You can roll it into a pillow or use it as a bolster with ease because of its flexibility. This will aid in your support. If you’re environmentally conscious you’ll like that this blanket is made of recycled fibers. So not only will you be enjoying maximum comfort but you’ll be playing your part in decreasing waste in the environment. This yoga blanket with tassels is more than just a yoga prop. Not only is it excellent for restorative yoga, you can also use it as a beach or picnic blanket. You don’t have to wait for your yoga class to show it off! You’ll definitely turn heads in your yoga class with this colorful blanket which comes in a variety of colors. It’s machine washable for easy maintenance. You can simply throw it any regular washing machine but be sure to wash it in cold temperatures and tumble dry it on low heat. This blanket will not only give you warmth and comfort but that extra padding is excellent for lending support for your yoga positions. Suffering from a tight hamstring? Simply place this blanket under your buttocks and meditate away. You can also place it under your knees, hips or back to aid your flexibility during those difficult yoga pose. Not only is it stylish but it’s thick enough to provide you with the necessary support during your yoga poses. You can also swing it over your bed as a fancy bedspread if you wish. 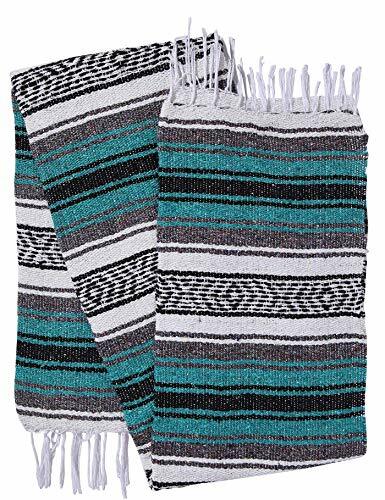 This isn’t your everyday Mexican blanket because it comes in a variety of posh colors including mint, pink, coral, turquoise and so much more. 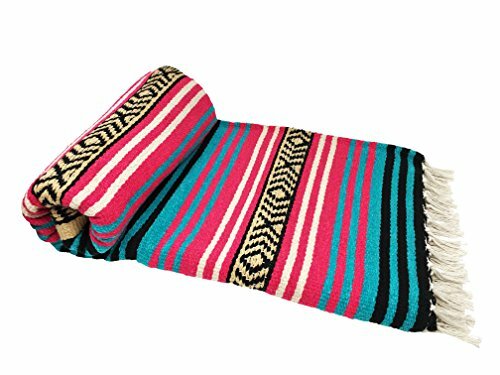 This authentic serape blanket is handmade and not only offers style but warmth and comfort. Did you know that purchasing this blanket means you’re giving back to people fighting poverty in South America? So why not enjoy your session while knowing you have contributed to a noble cause. Thinking of gifting your bestie a yoga blanket? With such a great mixture of colors no wonder it’s among our top recommendations. You don’t have to sacrifice style for comfort with this eye-catching blanket. Because of its thickness you can expect good padding for your knees to aid your yoga poses. It’s more durable than most yoga blankets on the market because of its tightly woven polyester fabric. Note that some customer reviews suggest it may feel a bit rough against more sensitive skin. This blanket is 74” x 56” making it larger than your average throw so you can easily transform it into different shapes for your yoga poses. It offers a sturdy design which is great for a workout stretch or outdoor yoga practice. 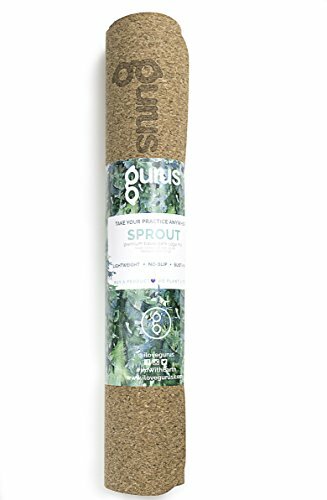 If you’re into traction or hot yoga, this blanket might be ideal for you plus it also works perfectly as an adjustable meditation bolster. If you’re looking for flexibility and ease of use you might like this one. Looking for a thick but soft yoga blanket? Then you might find this one ideal. It’s 78” x 54” in size, making it pretty large. It’s made of an acrylic-cotton-polyester blend and is machine washable for your convenience. If you like your blankets handmade, you’ll like this hand-woven high-quality blanket. The tight weave makes it durable and it won’t shed or peel, which is a definite plus. It still remains soft even after washing, which you might find useful, and the colors stay intact. However the actual colors might not be exactly as advertised online. On the upside, even though it’s specifically made for yoga you can also use it as a decorative throw. Talk about getting value for your money! Now that you have an idea of the best yoga blankets at your disposal and their features, which one will you choose? Is style or comfort important to you? An ideal yoga blanket must be thick enough to offer adequate support during your yoga pose and flexible enough to fold into different shapes. 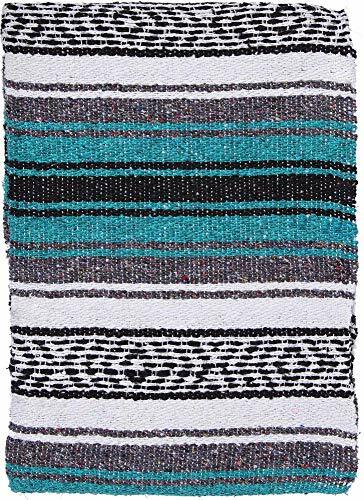 With that said, I’ll have to go with the El Paso Design Mexican Yoga Blanket. Why? Not only is it comfortable but it comes in a wide range of colors. It’s made of recycled fibers and the fabric makes it flexible enough to ensure well balanced postures during your yoga session. It’s made of tight woven material which means it’s durable. So you don’t have to worry about repurchasing another blanket in the near future. Best of all it’s easy to clean and maintain and the colors don’t fade after washing. Neither will you experience shrinkage. If that’s not a winner, I don’t know what is. So go ahead, choose a blanket and stretch away.